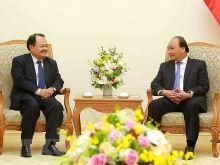 Within the framework of the official visit of SRV President to Russian Federation from June 28 to july 1, 2017, on June 29 afternoon in Moscow, Vietnamese President Tran Dai Quang and Russian President Vladimir Putin approved Russia - Vietnam Joint Statement, in which two leader have agreed to continue cooperation in building the Nuclear Scientific and Technologic Center in Vietnam and support Vietnam – Russia cooperation program in use of nuclear energy for peaceful purposes signed on May 23, 2017 in Hanoi. The two leaders also shared their wishes to strongly develop the multifaceted relationship on basic of tradition of the friendship and mutual respect for a long time between the two countries. The leaders specially emphasized the importance of joint efforts to expand relations in trade, investment, science, technology, education and humanity. 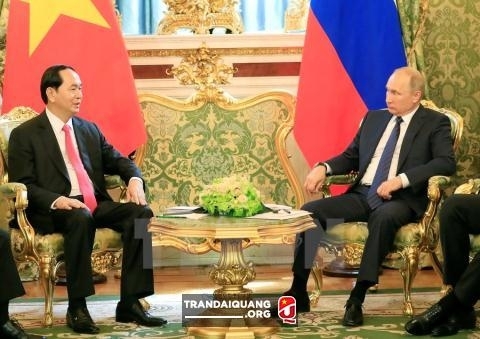 The two sides agreed to select 2019 as “Russia’s year in Vietnam” and “Vietnam’s year in Rrussia" with many plentiful activities on the territory of each country. 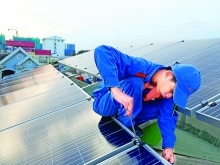 In the Joint Statement, the two sides affirmed to continuously create favorable conditions for Vietnam and Russian, gas enterprises to operate in territory of the two countries; cooperate in developing potential fields as oil refinery and petro-chemistry, LNG supply for Vietnam, production and sale of gas fuel for engines in Vietnam’s market. The two sides agreed to strengthern cooperation and extend oil and gas exploration and exploitation in continental shelf of Vietnam in accordance with United Nations Convention on the Law of the Sea 1982.